I used to work at the Howell Theatre and the staff actually used to go to the Brighton Cinema 9 for a late show after we closed the Howell Theatre because we only had one screen and they would have first runs. Kind of ironic that the Howell Theatre is still around. I was the manager of the Brighton from 1984-86. When I arrived, it was still a tri-plex. Although there was nothing special about the place architecturally - it was mostly cinder block - the place did have some state-of-the-art features at the time. It was the first theatre I managed (and I worked at many from 1980-1992) that had a computerized box office. 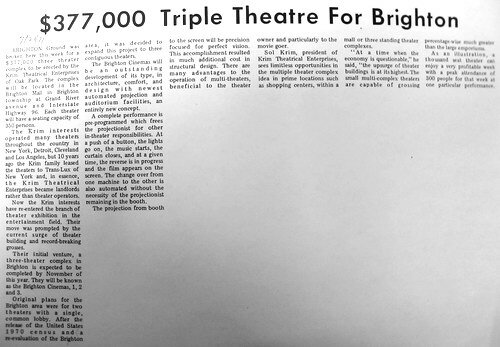 It was one of the first theatres in Michigan to have a Pacer box office computer, which printed each ticket individually and kept track of number of available seats with a touch of a button. It even printed out the box office reports. Sounds like nothing now, but that was amazing technology at the time. It also had three Cinemacannica projectors in the booth, and a full Dolby surround system in one of the auditoriums. 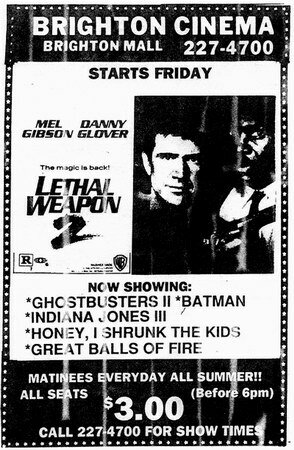 It was also one of the first theatres I worked at that had a Potts Platter in each booth, which meant no change overs. There were remote starts which allowed you to start the projector from the first floor - it was pretty impressive at the time. Sometime in 1985, the two theatres on either end were split from side to side, creating two small auditoriums, two medium and one large (the center) auditorium. It was a busy theatre and grossed well at the time - I had a lot of fun working there. the movie the gate starring stephen dorf had its premiere here. they wanted to premiere it in hell but found the closest place with a big enough theater that was 1980 something you can find info on the movie through google or wikipedia. 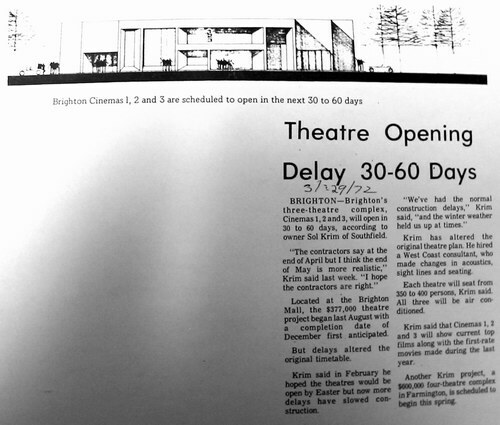 This theatre was slated to be expanded to 14 screens but it never happened. It was eventually closed and gave way to the Brighton Town Square 16 across the street. 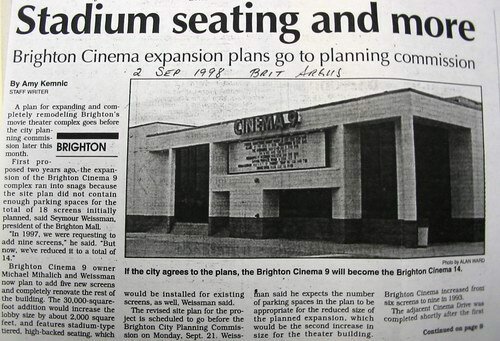 The Brighton 9 was demolished in late 2002. The place was not memorable in any way, yet I was a little sad to see it go for some reason.